The users’ role in prototyping can be summed up in two words: honest involvement. Without user involvement there is little reason to prototype. The precise behaviors necessary for interacting with a prototype can vary, but it is clear that the user is pivotal to the prototyping process. Realizing the importance of the user to the success of the process, the members of the systems analysis team must encourage and welcome input and guard against their own natural resistance to changing the prototype. Giving open reactions to the prototype. Suggesting additions to or deletions from the prototype. Users should be free to experiment with the prototype. In contrast to a mere list of systems features, the prototype allows users the reality of hands-on interaction. Mounting a prototype on an interactive Web site is one way to facilitate this interaction. Another aspect of the users’ role in prototyping requires that they give open reactions to the prototype. Analysts need to be present at least part of the time when experimentation is occurring. They can then observe users’ interactions with the system, and they are bound to see interactions they never planned. 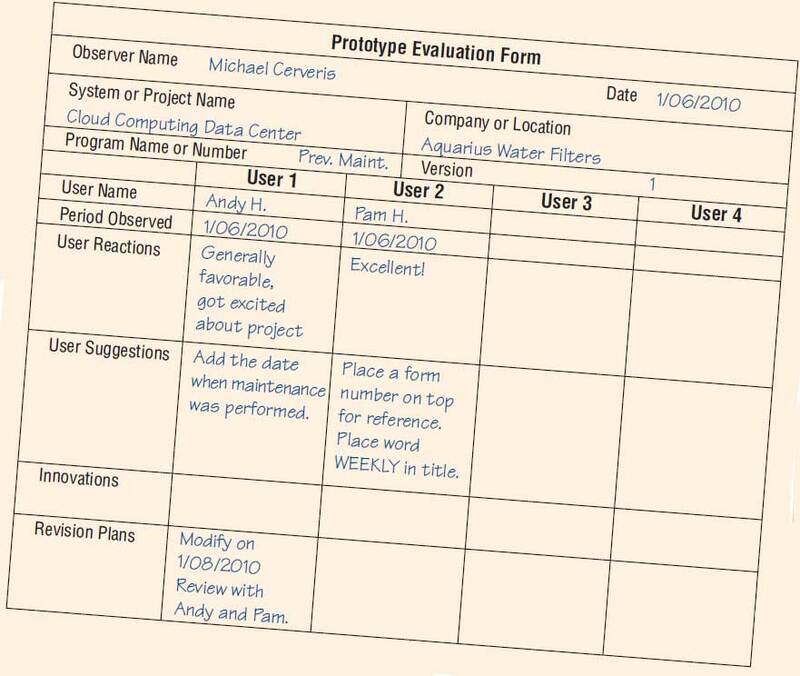 A filled-in form for observing user experimentation with the prototype is shown in the figure illustrated below. Some of the variables you should observe include user reactions to the prototype, user suggestions for changing or expanding the prototype, user innovations for using the system in completely new ways, and any revision plans for the prototype that aid in setting priorities. An important step in prototyping is to properly record user reactions, user suggestions, innovations, and revision plans. A third aspect of the users’ role in prototyping is their willingness to suggest additions to or deletions from the features being tried. The analyst’s role is to elicit such suggestions by assuring users that the feedback they provide is taken seriously, by observing users as they interact with the system, and by conducting short, specific interviews with users concerning their experiences with the prototype. 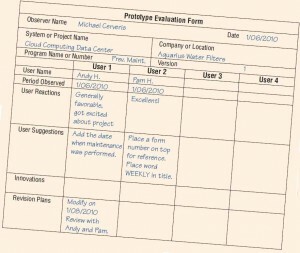 Although users will be asked to articulate suggestions and innovations for the prototype, in the end it is the analyst’s responsibility to weigh this feedback and translate it into workable changes where necessary. To facilitate the prototyping process, the analyst must clearly communicate the purposes of prototyping to users, along with the idea that prototyping is valuable only when users are meaningfully involved.